Consequences is a cautionary tale about the evils of hasty judgment, revisiting Jane Austen’s Pride and Prejudice and one of those pivotal moments, when Elizabeth Bennet decisively threw away Darcy’s offer of marriage. What transpired from that point is well known to Jane Austen’s extensive readership, but what if even one element in the chain of events in her novel had turned out differently? Would Jane Austen’s happy ending have eventually come to pass, or would the outcome have been more bleak? And if, in order to secure financial security for her loved ones, Elizabeth had not rejected Darcy, would she have married a proud, arrogant, disdainful man who would have, as she thought, forced her to deny her own relatives and thus have condemned herself to a lifetime of misery? Or would she have found herself married to a man who cared enough for her to reject the expected opposition of his family, chance his very standing in society in order to marry a woman he loved beyond measure? Consequences, written by the author of A Most Civil Proposal, examines the two halves of this coin, both tragedy and triumph. Charlotte Collins was engaged in inspecting her hens when she saw Mr. Darcy approaching the gate of the Parsonage, having come from the direction of Rosings Park. When he spied her, he greeted her in his usual polite but restrained manner, and she invited him to precede her to the house. Susan gave her mistress both the basket and a quick curtsey before running into the house, followed at a more reasonable gait by Mr. Darcy. Charlotte clucked her tongue disapprovingly, considering whether to admonish Susan yet again for running, but decided against it, for the young girl seemed naturally to break into a run whenever dispatched on an errand. Of greater import to her was the thought of Mr. Darcy and his frequent visits to the Parsonage. After his first impromptu visit, she suggested to Elizabeth he must be in love with her, but her friend’s description of the way he sat so silently, unable or unwilling to talk, made the idea seem unlikely. Since then, Mr. Darcy and his cousin Colonel Fitzwilliam made almost daily visits to the Parsonage, sometimes together, sometimes separately, and even occasionally accompanied by their aunt. Whatever Mr. Darcy’s motives, it was plain Colonel Fitzwilliam visited because he had pleasure in their society, a conjecture making him even more agreeable. Elizabeth remarked that his company was so affable and his admiration of her so evident, it reminded her of her former favourite, George Wickham. However, she continued, her assessment was that the good colonel appeared to have the better-informed mind, even if he did not have the same ability to captivate as did Mr. Wickham. Charlotte had made no response to this evaluation since her own opinion of Mr. Wickham was much at variance with that of her friend. In any case, she thought, as she finished gathering the eggs, I was thinking on Mr. Darcy and his reason for coming so often to the Parsonage. It is most difficult to decipher since he does not appear to come for the society. He frequently sits there for ten minutes without opening his lips, and when he does speak, it seems to be driven by necessity and not by choice—a sacrifice to propriety rather than a pleasure to himself. The way in which Colonel Fitzwilliam occasionally laughed at Mr. Darcy, for what he termed his cousin’s stupidity, made it seem likely he was different on most other occasions. However, since she never witnessed such pleasant behaviour from Mr. Darcy, she had no way of validating that possibility. Charlotte would have liked to believe this change was due to love—and the object of his love, her friend Eliza—so she set herself the task of working it out. She watched him whenever they were at Rosings and whenever he came to Hunsford, but she had little success. He certainly looked at Elizabeth a great deal, but she had never been able to tell whether his earnest, steadfast gaze was due to admiration or absence of mind. Of late, after she observed Mr. Darcy most carefully, she again suggested to Elizabeth the possibility of his being partial to her, but this suggestion met with no more agreement than previously. Her friend simply would not consider the suggestion seriously and always laughed at the idea. Charlotte did not press the subject on those occasions; she did not want to raise Eliza’s expectations for fear they might end in disappointment. In any case, she was not worried by Elizabeth’s oft-professed dislike of Mr. Darcy, for she was certain in her own mind that Elizabeth’s objections would vanish if she ever had reason to believe he might be in her power. On that point, she had no doubts whatever. Fitzwilliam Darcy strode through Rosings Park as the afternoon faded into evening, and an observer would have testified to seeing a gentleman of means, secure in his consequence and intention. His long stride made rapid work of the journey from Rosings, the home of his aunt, Lady Catherine de Bourgh, to his destination of the Hunsford Parsonage, where her parson, Mr. Collins, lived with his wife, Charlotte. His bearing was confident, his face composed, and his tread was relaxed and fluid, as befitted a young man of eight-and-twenty in the prime of health and fitness. But the observer would have missed the mark in several important areas, for this young man’s inner thoughts were in turmoil. For one, there was his destination of the Hunsford Parsonage, for he did not journey to see the parson or his wife, for they, along with Mrs. Collins’s sister, Miss Lucas, took tea at Rosings with his aunt. Rather, his interest was with Mrs. Collins’s other guest of the past few weeks, her lifelong friend from Hertfordshire, Miss Elizabeth Bennet, who was also cousin to Mr. Collins. Darcy was confounded that his once orderly life had become so completely unsettled. In the matter of choosing a wife to secure his future, he knew that his duty to his family and himself was to select a young lady of breeding who would be able to enhance or solidify the stature or fortune of the Darcy name. His parents, especially his mother, always emphasized how careful he must be to choose the right lady and not to be led astray by trivial attractions or lures, which so often ensnared unwary young men. But both his parents had passed on a number of years previously, leaving him in possession of substantial properties and fortune. They also left him without benefit of their sage advice when he found himself attracted to a young lady who, despite being the daughter of a respectable gentleman, otherwise did not satisfy the criteria his parents and other family members intended. Miss Bennet’s family was undistinguished, and her father’s income had not sufficed to allow for a respectable dowry. Yet Darcy’s mind, in fact his whole being, was now so focused on this bewitching young lady that he eventually arrived at the realization he could no longer contemplate a life without her at his side. He believed he had escaped her attraction when he departed Hertfordshire the previous autumn, then he arrived for his yearly visit to his Aunt Catherine only to find her ensconced at the Hunsford Parsonage, visiting the newly married Mrs. Collins. Perhaps it was his complete astonishment at meeting her again that affected him so strongly. But whatever the cause, Darcy knew he would never forget the vision of her when he and his cousin Colonel Richard Fitzwilliam arrived to visit the ladies. So severe was the shock on his first sight of Miss Bennet’s attractive form and her expressive face that he almost imagined himself struck by lightning. The sound of her velvety soprano voice brought back all his suppressed emotions, and he had not passed an unsettled moment since that initial meeting. Now he intended to violate every precept he had been taught about selecting the proper wife by offering marriage to this enchanting, but otherwise completely unsuitable, young lady. And yet, it did not matter to him—not in the slightest. He simply could not go on without her. He yearned to see her every day, to talk to her in the privacy and security of their home, to kiss those lovely lips, to make her smile, to hear her laugh. Nothing else mattered. Only by finalizing this step, which would certainly be censured by most of his family and many of his friends, could he calm his spirit and remove the turmoil from his life. Another component of his present tumult was that his plan to make a marriage proposal to Miss Bennet had depended on her attending tea at his aunt’s house with her cousin and her friend. Mr. Collins delivered the news that Miss Bennet was feeling ill in his usual, obsequious manner, clearly apprehensive that his patron might express her disapproval in her usual, forthright manner. Lady Catherine, however, took the news with no discernible emotion, only nodding in comprehension before returning to her concern of two quarrelling families in the village. Her nephew, however, received this unwelcome news with dismay, though he believed he managed to prevent any outward sign of discomfiture. Is she ill? he asked himself worriedly. She must be; it is the only explanation. She would not otherwise stay away. Indeed, she is expecting me to make my assurances, and we have only another day before we leave. My attentions have been too marked to be misinterpreted by a young lady of Miss Bennet’s acumen. He could not put his worry to rest. The longer he thought on her absence, the more concerned he became, and eventually he managed to slip away unnoticed. Or almost unnoticed, that is. His aunt was too engrossed in her lecture to observe his quiet departure, but his cousin Fitzwilliam looked over at him and raised his eyebrows in question. Darcy shook his head minutely and exited the drawing-room before claiming his hat and gloves from his room. The sudden sight of the gate to the Parsonage brought Darcy out of his reverie, and a moment later he knocked on the front door. He danced from foot to foot in his impatience as it took several minutes before one of the servants opened the door. “Miss Bennet, please,” Darcy said, hardly aware of the imperious tone in his voice, although apparently having no effect on the girl. “I believe she might be in the drawing-room,” said the maid negligently, giving a vague wave toward the rear of the house. She took Darcy’s hat and gloves, deposited them on a table by the door, and then disappeared through the door to the kitchen, leaving Darcy to stare after her in disapproval. Then, since he knew the way, he quickly moved to the open door and entered the room, immensely relieved to find Miss Bennet sitting by herself reading a letter. She looked up promptly, and surprise was evident on her face as she recognized him. Surprise? he thought in confusion. Why should she be thus? Surely, she must have known I would come. Then he wondered whether she expected him to attend her the following day, the last day before he and Fitzwilliam departed. This thought settled his nerves, and he looked at her with pleasure, completely unaware of his long-ago disparagement of her beauty. Now, he thought no lady nearly as handsome as Miss Elizabeth Bennet. “Yes, Mr. Darcy, my headache has diminished,” she said. Darcy was disturbed by her cool civility. He looked at her and tried to say something, but his thoughts were in such a whirl that he could not make his mouth form the words. He sat down, but his inner chaos would not permit him to remain stationary. He rose and walked about the room, conscious of the way Miss Bennet’s eyes followed him while she remained silent. Back and forth he walked, perturbed that the speech he wanted to deliver would not come. He had been more than eloquent in his thoughts the previous night and morning, but now he was struck dumb. This will not do! he thought in agony. I must say something—I must get out the words before I can begin to live again! The impact of this statement certainly brought a change in Miss Bennet’s demeanour! She flushed prettily and sat bolt upright in her chair, looking at Darcy intently, and he was naturally encouraged to continue. The words came easier to Darcy now, and he dwelt at length on how his attraction had grown, despite the clear difference between their different spheres, until he had come to the realization that she was the woman with whom he desired to spend the rest of his life. As he spoke, Darcy could see that Miss Bennet listened most intently, her eyes never leaving his. Her face appeared composed, but he was well aware, from small changes in her expression, that many thoughts were running through her consciousness. It was understandable, considering the wide gulf she was about to bridge in becoming his wife, but he had the utmost confidence she would manage the transition with grace and charm. Her inner strength of character, her steadfastness, her loyalty, indeed her courage, were among the attributes that played their part in capturing his affections. There! It is done! he thought triumphantly. He had never been comfortable in making those conversations that many others seemed to find so easy, but his task was complete. Perhaps now, especially with Miss Bennet at his side, it would become easier as time went by. He knew he must marry in order to secure an heir for his estates and properties, but he had been unwilling to make a selection from all those fashionable women who had thrown themselves at him over the years. Bingley’s sister Caroline was only the latest of an unending stream, and despite his aversion to her obsequiousness and petty spite, she was not even the worst of the young ladies he managed to evade. But now that dreadful period of his life was at an end; now he could start to live his life as it ought to be lived! Since he had finished speaking, Miss Bennet lowered her eyes to her hands, clenching a handkerchief in her lap. When she finally looked up at him to speak, he wondered what emotion was causing her to twist the handkerchief so fervently and triggering the colour to rise in her cheeks. What was that she said? Darcy thought in shock. ‘However unequally they may be returned’? Of what is she speaking? Darcy felt a black wave of disaster sweep over him as he leaned against the mantelpiece, staring at her with the fixity of a man staring into a highwayman’s pistol. That blackness engendered an almost instantaneous rage as he realized the woman he just deigned to offer to share his life had thrown his generous proposal back in his face! It took all his self-control to rein in his anger, and he was uncomfortably aware he was only partially successful in his endeavour. His jaws ached as he clenched his teeth against the urge to lash back at the person who now destroyed his hopes, and long moments limped by before he could trust himself to speak. Although the colonel may have been ignorant of the lady’s identity, Elizabeth knew at once that the lady in question was her dear sister Jane, the most affectionate, generous heart in the world. She previously held the opinion that Mr. Bingley’s sisters had the major share of accomplishing the breaking of her sister’s heart, but now she knew that Mr. Darcy was to blame for all Jane’s suffering. And he boasted of his actions to his cousin! As to the “very strong objections,” they were likely the hideous crime of having one uncle who was a country attorney and another who was in business in London! She had been hard pressed to conceal her anger from the amiable Colonel Fitzwilliam, who imparted this information in a light and jesting tone, but it was such a fitting picture of Mr. Darcy that she had not trusted herself to answer and thus abruptly changed the subject. They had talked on indifferent matters until they reached the Parsonage, and when she had gained the safety of her own room, she thought on what she had heard without interruption. The more she considered her new information, the brighter her anger flamed, and it had not diminished. And now, this man, who so smugly congratulated himself, wanted her to marry him? It was entirely inconceivable! Darcy clenched his teeth again to forestall an angry rejoinder as he contemplated the injustice that his efforts to help a friend were part of the reason for Miss Bennet’s astonishing rejection of his offer. Is this to be the transgression that divides us forever? he thought in dismay. Can she not see why I acted as I did? Is she so oblivious to the improprieties of her family, especially her mother, who would have forced her sister to accept an offer of marriage from Bingley? An offer that surely would have been forthcoming had I not acted. What would she have done if the positions were reversed, if her sister had a fortune and Bingley were as bereft of fortune as…as Wickham? Especially if Bingley had a grasping mother who acted as Mrs. Bennet did at Bingley’s ball! Miss Bennet paused, looking intently as if searching for something in his expression, but he had found his self-control at last. He could not repress the thin smile of grim amusement in feeling a sense of accomplishment at some miniscule victory in the midst of bleak catastrophe. “Can you deny that you have done it?” she asked sharply. Miss Bennet reacted to this plain assertion of fact as if she had been slapped, and her face paled in anger. At another time, Darcy might have regretted such a blunt formulation, but he was past caring. Clearly, he disastrously erred in believing Miss Bennet detected his attentions and awaited his addresses; she instead possessed the opposite opinion of him and was insensible of his admiration. If Darcy had been stunned before, it was nothing to the soul-consuming fury surging in him now, and had his control been less fixed, he knew he would have responded intemperately or stormed from the room. “You take an eager interest in that gentleman’s concerns,” Darcy finally managed through gritted teeth. He could feel the heat in his cheeks at this unbelievable charge, and he thought, How could this…this lady, succumb to Wickham’s lies and blandishments? Had she no wit at all? “Who that knows what his misfortunes have been, can help feeling an interest in him?” she responded sharply. Miss Bennet’s eyes flashed at this declaration, and Darcy was perversely pleased that she struggled to regain her own composure before she spoke. “You could not have made me the offer of your hand in any possible way that would have tempted me to accept it,” she continued, breaking into his thoughts. He turned sharply on his heel, and it took all of what little control he still maintained to retrieve his hat and gloves and exit the house without slamming the front door. He managed to pass through the gate, his wrath near to blinding him as he made his way into the Park. But, once he was certain he was unobserved, his restraint abandoned him, and he reeled in his tracks as despair swept away his anger. He spied a tree stump on which he might sit and collect himself, but now his motion was a jerky, loose-jointed gait more resembling a drunkard or a veritable babe than his normal, athletic stride. He had unconsciously managed to jam his hat on his head, after a fashion, but ignored his gloves. Those essential articles of a gentleman’s attire were carried in his left hand and dangled lifelessly at his side. When he reached the stump, he collapsed upon it as if the cosmic strings holding him upright had been cut. She refused me! he thought, and that solitary concept reverberated through his head, bouncing and rebounding inside the sphere of his consciousness. But if that thought was solitary, the emotions that accompanied it were both numerous and conflicting. Certainly, he seethed at the unfairness of the accusations she flung in his teeth, especially those regarding Wickham. Nevertheless, matched against his ire was at least the beginning of mortification at how he treated her sister. Despite his response to Miss Bennet in the Parsonage, reasons seeming so clear and straightforward in Hertfordshire and London were beginning to look less rational and more sordid. She accused him of selfish disdain for the feelings of others, and this allegation pierced his composure cruelly when he remembered how he had thought more of his need to separate himself from Miss Bennet’s fine eyes than of the impact on her sister or possibly even on Bingley. And, though his pride was affronted at being so cavalierly dismissed and of being accused of behaviour unfitting a gentleman, there existed in his befuddled mind a feeling of confusion so extreme he could not rationally consider all he had just experienced. Simplify, simplify! he commanded himself, remembering lessons learned in rhetoric at Cambridge. The matter of Wickham was the only one of her charges amenable to be so considered since it was clearly and factually false. On that, at least, he could defend himself! He seized that thought and clung to it, and his concentration allowed him to regain his feet and set off for Rosings. Darcy knew he could not make any defence to her in person. Discussions of that sort would have to be made in private, and such intimacy was no longer possible. He had already violated some measure of propriety in some of his previous visits, but he knew she would never again allow herself to be alone with him for even an instant. For his part, such a meeting would require a level of composure he knew he no longer possessed. No, he would have to meet her in the Park, if she did not determine to remain indoors until he and Fitzwilliam left on Saturday. And, since he knew a verbal account was beyond his powers, he determined he must make his defence on paper. He could then hope to meet her while she walked and put the letter in her hands. And what shall I do then? he asked himself in despair. He did not know, but he knew he would never see her again after tomorrow. There could be no real possibility of their meeting by accident, and certainly neither of them would ever pursue such an event. Her disapprobation was such that time could never heal it, and on his part, he could envisage nothing more mortifying to his shattered pride than to be reminded of such devastating events. He must devote himself completely to Georgiana and the affairs of his estate. In time, of course, he would be able to find a suitable partner for marriage; a Darcy heir was an essential duty. Eventually, time would blur the sharp angles and crystal clarity of this cataclysmic day. He knew it would come to pass. He wished he could believe it. Sitting in the solitude of her room, Elizabeth Bennet was again reading the astonishing—nay, astounding—letter Mr. Darcy had handed her earlier that morning. Her eyes followed the precisely written words, which she was close to knowing by heart, despite having the note in her possession little more than a pair of hours. She woke early, with all the recollections of the previous evening immediately flooding through her consciousness, and her mind was awhirl with a multitude of thoughts. Her disconcertment was so extreme that she thought to settle her anxieties by indulging in fresh air and exercise. However, she also remembered how often she chanced upon Mr. Darcy in the Rosings Park in the previous weeks, and she therefore determined to avoid her favourite paths in fear of a chance meeting. Her precautions came to naught as a fateful mischance brought them together despite her efforts. She made as if to turn away when she first spied his tall figure in a grove of trees just inside the Park; however, after hearing him call her name, she reluctantly turned back to him as he approached her. They met by one of the gates to the Park, she on the outside and he on the inside, and with a look of haughty composure, he handed her a folded, sealed square of paper and said, “Will you do me the honour of reading that letter?” She said not a word, merely accepted it, and with a slight bow, Mr. Darcy immediately departed. She read his letter the first time with a mixture of emotions that changed as she read further, and even when she finished it, she was completely at sea. For almost two hours, she wandered through the Park, re-reading the missive and dwelling with complete concentration on its contents, and only fatigue reminded her of her long absence, prompting her return to the Parsonage. Before entering the house, she determined to appear as cheerful as possible, but she was not able to maintain the façade for long and departed to her room as soon as she was able. Her eyes followed the now-familiar words of Mr. Darcy’s letter, unable to stop dwelling on the information contained therein. Be not alarmed, madam, on receiving this letter, by the apprehension of its containing any repetition of those sentiments or renewal of those offers which were last night so disgusting to you. I write without any intention of paining you or humbling myself by dwelling on wishes which, for the happiness of both, cannot be too soon forgotten, and the effort which the formation and the perusal of this letter must occasion should have been spared had not my character required it to be written and read. You must, therefore, pardon the freedom with which I demand your attention; your feelings, I know, will bestow it unwillingly, but I demand it of your justice. Elizabeth shook her head in complete perplexity, remembering her initial astonishment that Mr. Darcy could have the effrontery to believe he could justify his actions and any apology was possible. She almost stopped reading at that point, and the impulse to simply destroy the letter was nigh overwhelming. But her curiosity prevailed, and she continued. Two offences of a very different nature, and by no means of equal magnitude, you last night laid to my charge. The first-mentioned was that, regardless of the sentiments of either, I had detached Mr. Bingley from your sister; and the other, that I had, in defiance of various claims, in defiance of honour and humanity, ruined the immediate prosperity and blasted the prospects of Mr. Wickham. Wilfully and wantonly to have thrown off the companion of my youth, the acknowledged favourite of my father, a young man who had scarcely any other dependence than on our patronage, and who had been brought up to expect its exertion, would be a depravity to which the separation of two young persons, whose affection could be the growth of only a few weeks, could bear no comparison. But from the severity of that blame which was last night so liberally bestowed, respecting each circumstance, I shall hope to be in future secured when the following account of my actions and their motives has been read. If, in the explanation of them, which is due to myself, I am under the necessity of relating feelings which may be offensive to yours, I can only say that I am sorry. The necessity must be obeyed, and farther apology would be absurd. Elizabeth felt her anger again stimulated by this passage, revealing Mr. Darcy’s arrogance, but her ire was tempered by the following information. I had not been long in Hertfordshire before I saw, in common with others, that Bingley preferred your eldest sister to any other young woman in the country. But it was not till the evening of the dance at Netherfield that I had any apprehension of his feeling a serious attachment. I had often seen him in love before. At that ball, while I had the honour of dancing with you, I was first made acquainted, by Sir William Lucas’s accidental information, that Bingley’s attentions to your sister had given rise to a general expectation of their marriage. He spoke of it as a certain event, of which the time alone could be undecided. From that moment I observed my friend’s behaviour attentively, and I could then perceive that his partiality for Miss Bennet was beyond what I had ever witnessed in him. Your sister I also watched. Her look and manners were open, cheerful, and engaging as ever, but without any symptom of peculiar regard, and I remained convinced from the evening’s scrutiny that, though she received his attentions with pleasure, she did not invite them by any participation of sentiment. If you have not been mistaken here, I must have been in an error. Your superior knowledge of your sister must make the latter probable. If it be so, if I have been misled by such error to inflict pain on her, your resentment has not been unreasonable. But I shall not scruple to assert that the serenity of your sister’s countenance and air was such as might have given the most acute observer a conviction that, however amiable her temper, her heart was not likely to be easily touched. That I was desirous of believing her indifferent is certain—but I will venture to say that my investigations and decisions are not usually influenced by my hopes or fears. I did not believe her to be indifferent because I wished it; I believed it on impartial conviction as truly as I wished it in reason. My objections to the marriage were not merely those which I last night acknowledged to have required the utmost force of passion to put aside in my own case; the want of connection could not be so great an evil to my friend as to me. But there were other causes of repugnance—causes which, though still existing, and existing to an equal degree in both instances, I had myself endeavoured to forget because they were not immediately before me. These causes must be stated, though briefly. The situation of your mother’s family, though objectionable, was nothing in comparison of that total want of propriety so frequently, so almost uniformly betrayed by herself, by your three younger sisters, and occasionally even by your father. Pardon me. It pains me to offend you. But amidst your concern for the defects of your nearest relations and your displeasure at this representation of them, let it give you consolation to consider that, to have conducted yourselves so as to avoid any share of the like censure, is praise no less generally bestowed on you and your eldest sister than it is honourable to the sense and disposition of both. I will only say farther that, from what passed that evening, my opinion of all parties was confirmed and every inducement heightened which could have led me before to preserve my friend from what I esteemed a most unhappy connection. He left Netherfield for London on the day following as you, I am certain, remember with the design of soon returning. The part which I acted is now to be explained. His sisters’ uneasiness had been equally excited with my own; our coincidence of feeling was soon discovered, and alike sensible that no time was to be lost in detaching their brother, we shortly resolved on joining him directly in London. We accordingly went, and there I readily engaged in the office of pointing out to my friend the certain evils of such a choice. I described and enforced them earnestly. But, however this remonstrance might have staggered or delayed his determination, I do not suppose that it would ultimately have prevented the marriage had it not been seconded by the assurance, which I hesitated not in giving, of your sister’s indifference. He had before believed her to return his affection with sincere if not with equal regard. But Bingley has great natural modesty with a stronger dependence on my judgment than on his own. To convince him, therefore, that he had deceived himself was no very difficult point. To persuade him against returning into Hertfordshire, when that conviction had been given, was scarcely the work of a moment. I cannot blame myself for having done thus much. There is but one part of my conduct in the whole affair on which I do not reflect with satisfaction; it is that I condescended to adopt the measures of art so far as to conceal from him your sister’s being in town. I knew it myself as it was known to Miss Bingley, but her brother is even yet ignorant of it. That they might have met without ill consequence is perhaps probable, but his regard did not appear to me enough extinguished for him to see her without some danger. Perhaps this concealment, this disguise, was beneath me; it is done, however, and it was done for the best. On this subject I have nothing more to say, no other apology to offer. If I have wounded your sister’s feelings, it was unknowingly done, and though the motives which governed me may to you very naturally appear insufficient, I have not yet learnt to condemn them. She could not read of Mr. Darcy’s belief of her sister’s indifference nor of his lack of regret for what he had done without being roused to anger, but again a perplexity of emotions tore at such a simple explanation. As she read and re-read this passage, she unwillingly came to a realization of his accurate appraisal of the lack of propriety of most of her family. 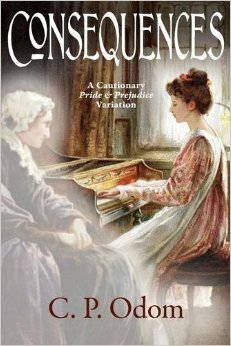 It was mortifying to be forced to agree with any part of what he alleged, but as she remembered the wild behaviour of her two youngest sisters, Lydia and Kitty, as well as her mother’s boasts that she expected Jane to soon be well settled at Netherfield, honesty forced her to acknowledge that Mr. Darcy simply related the bald truth—especially when his statements were buttressed by his account of his association with Mr. Wickham. With respect to that other, more weighty accusation of having injured Mr. Wickham, I can only refute it by laying before you the whole of his connection with my family. Of what he has particularly accused me I am ignorant, but of the truth of what I shall relate, I can summon more than one witness of undoubted veracity. Mr. Wickham is the son of a very respectable man, who had for many years the management of all the Pemberley estates and whose good conduct in the discharge of his trust naturally inclined my father to be of service to him; and on George Wickham, who was his godson, his kindness was therefore liberally bestowed. My father supported him at school and afterwards at Cambridge—most important assistance as his own father, always poor from the extravagance of his wife, would have been unable to give him a gentleman’s education. My father was not only fond of this young man’s society, whose manners were always engaging, he had also the highest opinion of him, and hoping the church would be his profession, intended to provide for him in it. As for myself, it is many, many years since I first began to think of him in a very different manner. The vicious propensities—the want of principle, which he was careful to guard from the knowledge of his best friend, could not escape the observation of a young man of nearly the same age with himself and who had opportunities of seeing him in unguarded moments, which Mr. Darcy could not have. Here again I shall give you pain—to what degree you only can tell. But whatever may be the sentiments which Mr. Wickham has created, a suspicion of their nature shall not prevent me from unfolding his real character; it adds even another motive. Elizabeth remembered the first time she read this passage and how it inflamed her anger at his insufferable conceit. However, repeated readings of the whole led her to conclusions so different from her expectations that she still was astonished at her changed opinion of Mr. Wickham. She shook her head in mortification at her errors and continued reading. My excellent father died about five years ago, and his attachment to Mr. Wickham was to the last so steady that in his will he particularly recommended it to me to promote his advancement in the best manner that his profession might allow—and if he took orders, desired that a valuable family living might be his as soon as it became vacant. There was also a legacy of one thousand pounds. His own father did not long survive mine, and within half a year from these events, Mr. Wickham wrote to inform me that, having finally resolved against taking orders, he hoped I should not think it unreasonable for him to expect some more immediate pecuniary advantage in lieu of the preferment by which he could not be benefited. He had some intention, he added, of studying the law, and I must be aware that the interest of one thousand pounds would be a very insufficient support therein. I rather wished than believed him to be sincere but, at any rate, was perfectly ready to accede to his proposal. I knew that Mr. Wickham ought not to be a clergyman; the business was therefore soon settled; he resigned all claim to assistance in the church, were it possible that he could ever be in a situation to receive it, and accepted in return three thousand pounds. All connection between us seemed now dissolved. I thought too ill of him to invite him to Pemberley or admit his society in town. In town I believe he chiefly lived, but his studying the law was a mere pretence, and being now free from all restraint, his life was a life of idleness and dissipation. For about three years, I heard little of him, but on the decease of the incumbent of the living which had been designed for him, he applied to me again by letter for the presentation. His circumstances, he assured me—and I had no difficulty in believing it—were exceedingly bad. He had found the law a most unprofitable study and was now absolutely resolved on being ordained if I would present him to the living in question—of which he trusted there could be little doubt as he was well assured that I had no other person to provide for, and I could not have forgotten my revered father’s intentions. You will hardly blame me for refusing to comply with this entreaty or for resisting every repetition of it. His resentment was in proportion to the distress of his circumstances, and he was doubtless as violent in his abuse of me to others as in his reproaches to myself. After this period every appearance of acquaintance was dropt. How he lived I know not. But last summer he was again most painfully obtruded on my notice. Elizabeth was astonished by this last. I cannot believe I leapt to conclusions that pleased my vanity because I already disliked Mr. Darcy—and with no evidence other than Mr. Wickham’s word! I fancied myself a superior judge of character, yet so many things are clear now. Oh, to have been duped in such a manner by Mr. Wickham! How could I have been so blind? I must now mention a circumstance which I would wish to forget myself, and which no obligation less than the present should induce me to unfold to any human being. Having said thus much, I feel no doubt of your secrecy. My sister, who is more than ten years my junior, was left to the guardianship of my mother’s nephew Colonel Fitzwilliam and myself. About a year ago she was taken from school and an establishment formed for her in London, and last summer she went with the lady who presided over it to Ramsgate; and thither also went Mr. Wickham, undoubtedly by design, for there proved to have been a prior acquaintance between him and Mrs. Younge, in whose character we were most unhappily deceived; and by her connivance and aid, he so far recommended himself to Georgiana, whose affectionate heart retained a strong impression of his kindness to her as a child, that she was persuaded to believe herself in love and to consent to an elopement. She was then but fifteen, which must be her excuse, and after stating her imprudence, I am happy to add that I owed the knowledge of it to herself. I joined them unexpectedly a day or two before the intended elopement, and then Georgiana, unable to support the idea of grieving and offending a brother whom she almost looked up to as a father, acknowledged the whole to me. You may imagine what I felt and how I acted. Regard for my sister’s credit and feelings prevented any public exposure, but I wrote to Mr. Wickham, who left the place immediately, and Mrs. Younge was of course removed from her charge. Mr. Wickham’s chief object was unquestionably my sister’s fortune, which is thirty thousand pounds, but I cannot help supposing that the hope of revenging himself on me was a strong inducement. His revenge would have been complete indeed. She could not read this paragraph without cringing in shame. She knew of Mr. Darcy’s affection for his sister, no matter what else she might have believed about his character, and almost to have lost her to a scoundrel like Mr. Wickham must have frightened and mortified him beyond belief. No wonder he hesitated to inform the local families of Mr. Wickham’s many failings. He must have feared that doing so would necessitate giving a substantive example of Wickham’s conduct, and anyone would wish to keep such information about a sister private rather than sharing it with all and sundry. I have been foolish, foolish, foolish! This, madam, is a faithful narrative of every event in which we have been concerned together, and if you do not absolutely reject it as false, you will, I hope, acquit me henceforth of cruelty towards Mr. Wickham. I know not in what manner, under what form of falsehood he has imposed on you, but his success is not perhaps to be wondered at, ignorant as you previously were of everything concerning either. Detection could not be in your power and suspicion certainly not in your inclination. You may possibly wonder why all this was not told you last night, but I was not then master enough of myself to know what could or ought to be revealed. For the truth of everything here related, I can appeal more particularly to the testimony of Colonel Fitzwilliam, who, from our near relationship and constant intimacy and still more as one of the executors of my father’s will, has been unavoidably acquainted with every particular of these transactions. If your abhorrence of me should make my assertions valueless, you cannot be prevented by the same cause from confiding in my cousin, and that there may be the possibility of consulting him, I shall endeavour to find some opportunity of putting this letter in your hands in the course of the morning. I will only add, God bless you. All manner of unpleasant recollections ran through her mind as she gathered the pages of the letter together and refolded them. She remembered especially the way in which she accepted Mr. Wickham’s tale about being betrayed by the son of his benefactor. She never even considered demanding proofs of such malfeasance; even worse, she did not recognize the impropriety associated with anyone spinning such a story within a half-hour of being introduced. The disparity in how she acted toward both Mr. Darcy and Mr. Wickham inspired the most intense mortification—she could not think of either without feeling she had been blind, partial, prejudiced, and absurd. And, while Mr. Darcy’s explanation restored her former, good opinion of Mr. Bingley, it also heightened the sense of what Jane lost. Instead of achieving a situation so desirable in every respect and so promising for her future happiness, she had been deprived by the folly and indecorum of her own family as much as by the actions of Mr. Darcy. This latter thought made even the foolishness of her own past behaviour appear less significant, for the unhappy defects of her family were hopeless of remedy. Her father was content to laugh at the silliness of his youngest daughters, and he would not exert himself to curb their giddiness or their wild behaviour; her mother, with manners far from proper, was completely insensible to the evils of indulging the embarrassing conduct of Kitty and Lydia. Mr. Darcy’s letter, with its compliment to Jane and herself as being exempt from his charge of impropriety, only partly soothed her humiliation; it could not console her for the contempt so deservedly attached to the rest of her family. When she reflected on how materially the credit of Jane and herself must be hurt by such unseemly comportment, she felt depressed beyond anything she had known before. Her feelings toward the writer of the letter were vastly different as she contemplated the various parts of the letter. His manner of address and lack of remorse toward his attempt to separate Jane and Mr. Bingley fuelled her indignation, but her memory of the manner in which she condemned and upbraided him, especially in the matter of Mr. Wickham, was such as to turn her anger toward herself. But even if she acquitted Mr. Darcy of some transgressions, it did not change her feelings toward him, and she did not for a moment repent her refusal or feel the slightest inclination ever to see him again. At least she would be leaving the place in exactly one week. While she enjoyed the company of Charlotte and was amused by the absurdities of Mr. Collins and Lady Catherine, there were painful memories she would be most happy to put behind her. In addition, there was the lure of regaining the solace of her beloved Jane, so much so she could not wait for the week to end.